Back in the 1920s, it seemed everything was becoming coin-operated. All over the U.S., you could find coin-operated weighing machines at railroad stations; coin-operated vending machines were chock full of candy, cigarettes and other tasty treats; and the automatic coin-operated shoe shine machine was even threatening to put its flesh-and-blood counterpart out of a job. A 1926 issue of Radio News magazine called dropping coins in a slot the great American past-time. 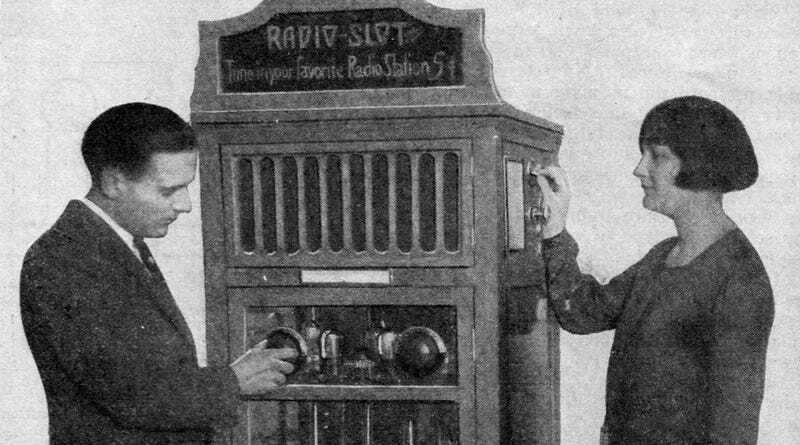 But unlike the candy vending machine or even weighing machines, there's one Jazz Age coin contraption that you'd be hard pressed to find today: the coin-operated radio. If you forget to bring your pocket portable-receiver with you, and there is a program on the air that you are particularly anxious to hear, just walk into a store that has one of these radio receiver slot machines, drop a nickel in the slot, set the two dials of the set—and your station will be heard from the loud speaker in the top of the machine. This slot machine made its appearance recently in Philadelphia and consists of a five-tube radio frequency receiver, having one stage tuned R.F., one stage of fixed R.F., detector and two stages of audio frequency amplification. There is also a timing mechanism which limits the reception to five minutes. On the side of the machine next to the slot in which the nickels are deposited, is a table showing the times when stations are broadcasting and also the necessary dial settings of the receiver. The small knob below the slot is turned after the nickel is deposited. This starts the motor which operates the timing mechanism. After four minutes of music a red electric lamp lights in the front of the cabinet, warning the listener that if he wishes to continue the reception beyond the period of another minute another nickel must be dropped in the slot. This must be repeated every five minutes. The opening of the loud speaker horn is behind the grill work above the dials of the receiver, and the timing mechanism is under it. Before long, it is possible these machines will be as common a sight as the many different types of vending machines that are familiar to everybody today and then the American boy and girl will have another slogan, "Papa, gimme a nickel I waunta hear some radio music!" The coin-operated radio would find some success in hotels, motels and hospitals (largely before television hit the scene in an affordable way), but eventually the technology faded away without much fanfare. Perhaps it was because the coin-operated radio left too much to chance. Sure, you might have a favorite music station that you'd like to share with everybody else at the malt shop. But when it comes to spending your hard earned nickels, the coin-operated jukebox was the only logical choice for delivering the exact song you were dying to hear.